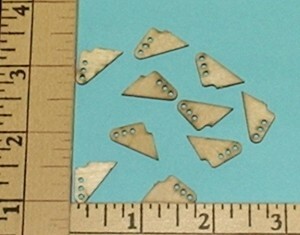 1/32 aircraft ply small laser horns. Mounting surface area on these are idealy suited to models with 3/32 to 1/4" thick control surfaces. These horns have holes correct for 1/32 wire used in all the smallest servos such as GWS Pico/Naro, HS-50, PS-20. HE490, HE2003, MX30 and many others. kits. Install horns in a slot in surface, because of the large contact area, they won't wobble like plastic pin type horns do. This results in finer better control and fewer trim changes in flight. 8 horns per package. Metallic control horn. Get a pair and setup for pull-pull. Includes fasteners, back plate and bushings for clevis. Bushing construction and plastic color may differ from factory stock photo. Left and Right Pair. Du-Bro heavy duty horn set with fasteners and 4-40 ball joints. 2 complete units per package. 1" control radius. 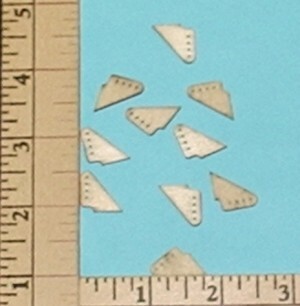 1/32 aircraft ply small laser horns. 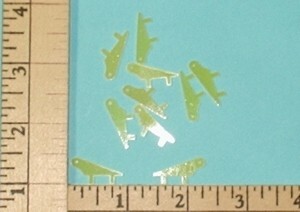 Mounting surface area on these are idealy suited to models with 1/16 to 1/8" thick control surfaces. These horns have holes correct for 1/32 wire used in all the smallest servos such as GWS Pico/Naro, HS-50, PS-20. HE490, HE2003, MX30 and many others. kits. Install horns in a slot in surface, because of the large contact area, they won't wobble like plastic pin type horns do. This results in finer better control and fewer trim changes in flight. 8 horns per package. Same horns found in our Micro-Stick and Mini-Stick kits. 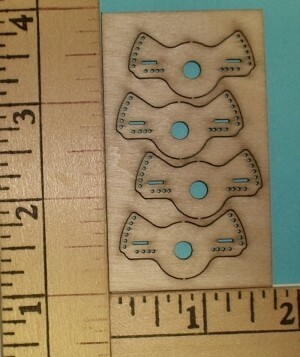 1/32 aircraft ply large laser horns. Large mounting surfase area on these are idealy suited to models with thick control surfaces like foamies. These horns have holes correct for 1/32 wire used in all the smallest servos such as GWS Pico/Naro, HS-50, PS-20. HE490, HE2003, MX30 and many others. kits. Install horns in a slot in surface, because of the large contact area, they won't wobble like plastic pin type horns do. This results in finer better control and fewer trim changes in flight. 8 horns per package. Set of two control horns for control surfaces, aileron, flaps, elevator or rudder. Black nylon material. 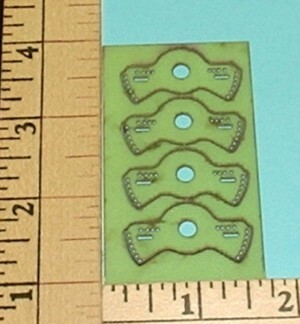 Mounting surface area on these are ideally suited to models with 3/32 to 1/4" thick control surfaces. 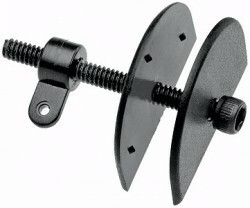 Horn is mounted on 5-40 threaded bolt for adjustment of throw or surface travel. Includes diagram of installation instructions. Use on 25 to 60 size models. Two Pack, Du-Bro Micro2 Control Horn is 5/8" in height and is great for the larger scale micro aircraft. Horn has 2 pins on bottom for securing to surface. New Du-Bro Micro Control Horn set. 1/2" working height/length. Molded pin on flat bottom for easy installation. After gluing, excess pin can be trimmed off. Great for indoor and park flyers! 2/pkg. Set of five control horns, for control surfaces. 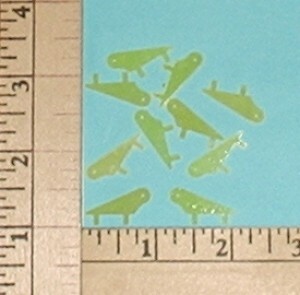 Opaque fiberglass material. Precision cut. Mounting surface area on these are idealy suited to models with 3/32 to 1/4" thick control surfaces. These horns have holes correct for 1/32 wire commonly used in park fliers and F3P models. Note: 25mm size includes a backup plate. 5ea/pack. A nice, lightweight, durable product! Upper left hand in photo. 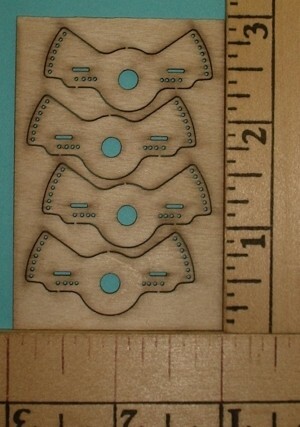 Tim McDonough's control horns come ten (10) to a package and are cut from 1/16 inch thick high quality aircraft plywood. Holes drilled for .032 wire. 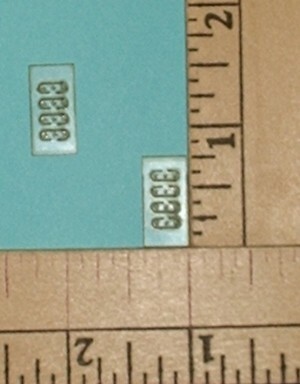 Can be enlarged to 2mm (use #51 .067 drill bit gently by hand) or 2-56 (use #50 .070" drill bit). Glue into your balsa / composite or foam surfaces. Tim McDonough's control horns come ten (10) to a package and are cut from 1/16 inch thick high quality aircraft plywood. Holes drilled for nug fit on 2-56 wire .070"). Glue into your balsa / composite or foam surfaces. Control horn has pins intended to be pressed into foam. Can be installed in balsa also. 22mm long, control radius 6mm. Note, control radius given if hinge line were at same surface as horn mounting. If you put this horn on 3mm material that is center hinged, your control radius would be +1.5mm. If hinged at opposite surface control radius would be +3mm. Material is .032 (.8mm) G10 fiberglass. 8 horns per package. Control horn has pins intended to be pressed into foam. Can be installed in balsa also. 22.5mm long, control radius 6.5mm. Note, control radius given if hinge line were at same surface as horn mounting. If you put this horn on 3mm material that is center hinged, your control radius would be +1.5mm. If hinged at opposite surface control radius would be +3mm. Material is .032 (.8mm) G10 fiberglass. 8 horns per package. Control horn has pins intended to be pressed into foam. Can be installed in balsa also. 23mm long, control radius 7mm. Note, control radius given if hinge line were at same surface as horn mounting. If you put this horn on 3mm material that is center hinged, your control radius would be +1.5mm. If hinged at opposite surface control radius would be +3mm. Material is .032 (.8mm) G10 fiberglass. 8 horns per package. Temporarily unavailable, factory back order. Custom designed for F3P competition aircraft and similar foamies. This set contains all the control horns, stand offs and transfer horns you can use on any one project. Control horns have long mounting leg that can be trimmed to fit your control surface/application. Control rod stand offs are included as are aileron transfer horns for the bipe enthusiasts. We thank Seth Arnold for flying our F3P horn sets to victory at the 2009 ETOC. Designed in conjunction with Scott Barnhart. The "Y" horn is for those that prefer a pull-pull rudder setup. 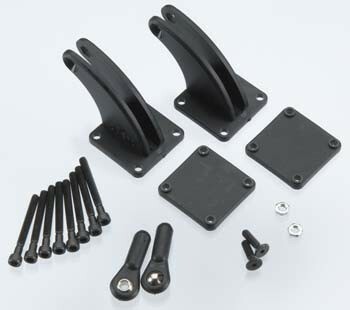 Included is a set of 4 micro tension adjusters for your pull-pull lines. The adjusters allow you to loom up your lines like a tent line so you can adjust the tension of your control strings as weather and temperature demands. Note the extra special Biased Servo Horn. This can be screwed or sewn to many common micro dual arm servo horns. Normally the aileron control horns are a bit farther apart than the spread of a stock servo horn. 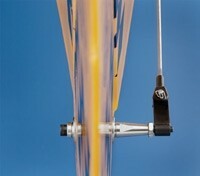 The Biased horn allows you to connect your aileron pushrod so that the rod is 90 degrees to the horn eliminating differential movement the stock horn would cause. Lets get busy and get some building done! 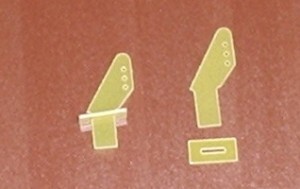 F3P Control Horn Set #2 in 1/32 Aircraft Ply. Features our professional biased servo horn (#1), Horns for Ailerons, horn for rudder with hinge line offset and elevator horn with both hinge line offset and notch to clear carbon stiffener strip. Designed in conjunction with Scott Barnhart. Same sets as above cut in .020 Fiberglass. Designed in conjunction with Scott Barnhart. We thank Seth Arnold for flying our F3P horn sets to victory at the 2009 ETOC. Same as above but cut from .020 Fiberglass. Designed in conjunction with Scott Barnhart. Our F3P biased servo horn used by many top competition pilots. 4 peices per sheet. Control Radius .750" (Equivelant to 1.5" spread servo horn). 7 Holes are offset in 5 degree steps starting at 5 degrees and ending at 35 degrees. Holes are precision drilled at .031 to be snug zero slop fit to common .032 pin control rod fittings and music wire. May be sewn and glued to many standard horns. 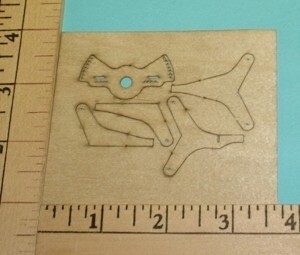 Laser cut from 1/32 aircraft grade plywood. Strong and light weight. I've never had a report of a broken horn. Same horn as provided in complete control horn sets above. Designed in conjunction with Scott Barnhart. Our F3P biased servo horn used by many top competition pilots. 4 peices per sheet. Control Radius .750" (Equivelant to 1.5" spread servo horn). 7 Holes are offset in 5 degree steps starting at 5 degrees and ending at 35 degrees. Holes are precision drilled at .031 to be snug zero slop fit to common .032 pin control rod fittings and music wire. May be sewn and glued to many standard horns. 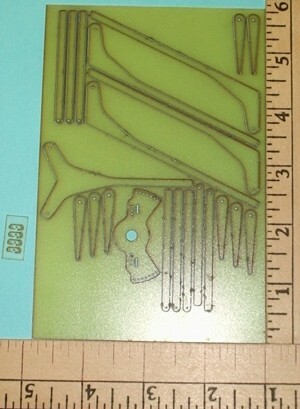 Laser cut from .020 fiberlgass. Strong and light weight. I've never had a report of a broken horn. Same horn as provided in complete control horn sets above. Designed in conjunction with Scott Barnhart. Our F3P biased servo horn used by many top competition pilots. 4 peices per sheet. Control Radius .625" (Equivelant to 1.25" spread servo horn). 6 Holes are offset in 6 degree steps starting at 5 degrees and ending at 35 degrees. Holes are precision drilled at .031 to be snug zero slop fit to common .032 pin control rod fittings and music wire. May be sewn and glued to many standard horns. Laser cut from 1/32 aircraft grade plywood. Strong and light weight. I've never had a report of a broken horn. Our F3P biased servo horn used by many top competition pilots. 4 peices per sheet. Control Radius .625" (Equivelant to 1.25" spread servo horn). 6 Holes are offset in 6 degree steps starting at 5 degrees and ending at 35 degrees. Holes are precision drilled at .031 to be snug zero slop fit to common .032 pin control rod fittings and music wire. May be sewn and glued to many standard horns. Laser cut from .020 Fiberglass. Strong and light weight. I've never had a report of a broken horn. Designed in conjunction with Scott Barnhart. 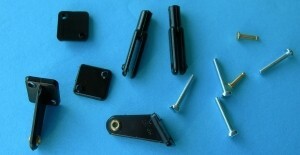 8 each of our Micro Pull Pull Tension Adjusters. Alows you to loop your pull pull string through a horn then back to this adjuster which can be slipped and locked along the lenght of the cord running to the horn. Works like a tent pole rope adjuster. Use on F3P and other small models with pull-pull control functions. A very difficult part to make by hand simplified for you here. Great for indoor and micro park flyers! A pack of 10 pcs. 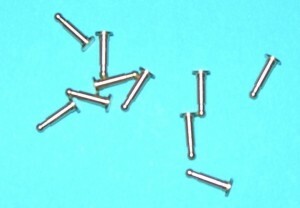 Du-Bro part with fasteners. Made to accept clevis pins typical in 2-56 hardware. Use anywhere you want a shorter horn, not just for 1/2A size models. 2 complete units per package. Du-Bro Control Horn set. 1 1/16" working height/length. 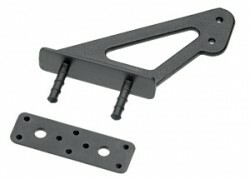 Molded from Nylon, left and right handed flange mount with nut plate. 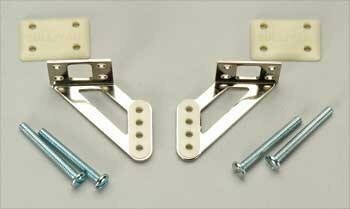 Complete with fasteners for easy installation. 2 per pkg. 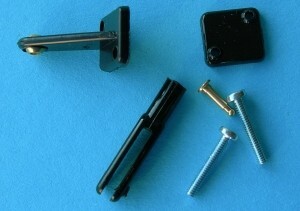 Dubro part with fasteners. 2 complete units per package. 1 3/8 Long with 5 adjustment positions. Each set incluees 2 control horns that are center on base, 2 self threading nut plates and (4) 2-56 x 5/8 screws. These large scale T-Style control horns were aerodynamically designed with large scale planes in mind. 1 3/8 long with 4 adjustment positions and 4 mounting holes. Comes complete with back plate and (4) 4-40 x 1 Socket Head Cap Screws. 2 complete units per package. Set of five control horns, for control surfaces. Opaque fiberglass material. Precision cut. 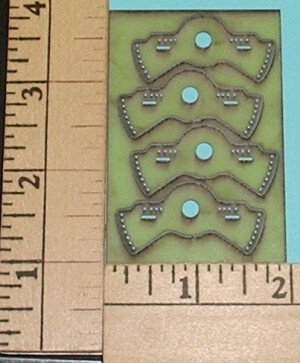 Mounting surface area on these are idealy suited to models with 3/32 to 1/4" thick control surfaces. These horns have holes correct for 1/32 wire which is used in most park flier and F3P applications. Upper right hand horn in photo. Set of five control horns, for control surfaces. Opaque fiberglass material. Precision cut. Mounting surface area on these are idealy suited to models with 3/32 to 1/4" thick control surfaces. These horns have holes correct for 1/32 wire which is used in most park flier and F3P applications. Lower left hand horn in photo. Set of five control horns, for control surfaces. Opaque fiberglass material. Precision cut. Mounting surface area on these are idealy suited to models with 3/32 to 1/4" thick control surfaces. 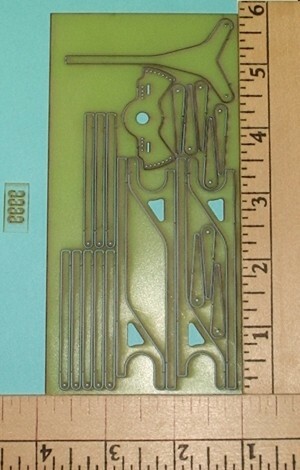 These horns have holes correct for 1/32 wire which is used in most park flier and F3P applications. Lower right hand horn in photo. Large size horn useful for all control surfaces. Drilled for #2-56 (or 2mm) bolt-on ball joints. May be enlarged. Mounting flange drilled for #2 fasteners, may also be enlarged. Solid glass filled horn. May come in CB Associates or B&B Specialties packaging. Bushings for small clevis pins not included. This horn is intended for large control rod hardware. #2 fasteners minimum. Custom designed for F3P competition aircraft and similar foamies. This set contains all the most popular parts from our full rod and shink set. No bipe aileron transfer horns or stand offs in this set. 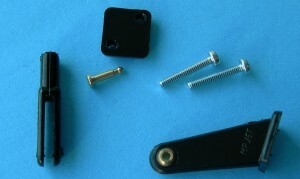 Our ever popular #1 biased control horn for your center aileron servo is included. Think BIG!! These HD Adjustable Control Horns are the latest in a family of innovative control horn applications. The self-adjusting horn will mount straight (90? to center line of control surface) against the angled control surface using no wedges or shims! With two sizes available, your aircraft will be even more functional as well as stylish. Intended for .91 and above aircraft. 2 complete units in each package. 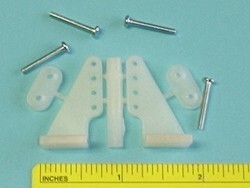 2 units per package complete with bases and fasteners. Nice 3 bolt aero shape base. Intended for 4-40 (or 2.5mm) thru-bolt ball joint type clevis ends. One complete units with all fasteners and snap pin included. Excellent quality gear. For extra nap pins, order MPJ2234. Two complete units with all fasteners and snap pins included. Excellent quality gear. For extra nap pins, order MPJ2234. 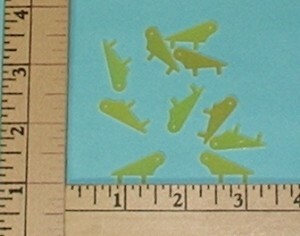 Package of 10 each extra Snap Pins for MPJ2230,2231,2232,2233 small, short and long control horns. Micro horn for smaller models. Glue into slot in control surface. 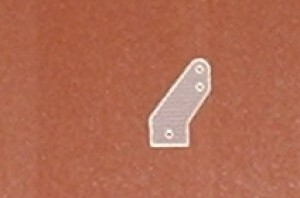 Drilled for .039 (1mm) Wire Z and L bends or other similar micro control rod ends. Can be drilled out to larger sizes if you wish. In the size range of park flyer and indoor pushrods all over the world. 2 per package. Micro horn for smaller models. Glue into two punctures in control surface. Drilled for .025" (.6mm) Wire Z and L bends or other similar micro control rod ends. Can be drilled out to larger sizes if you wish. Typical size for indoor pushrods all over the world. 2 per package. Micro horn for smaller models. Glue into two punctures in control surface. Drilled for .032" (.8mm) Wire Z and L bends or other similar micro control rod ends. Can be drilled out to larger sizes if you wish. Typical size for indoor pushrods all over the world. 2 per package.